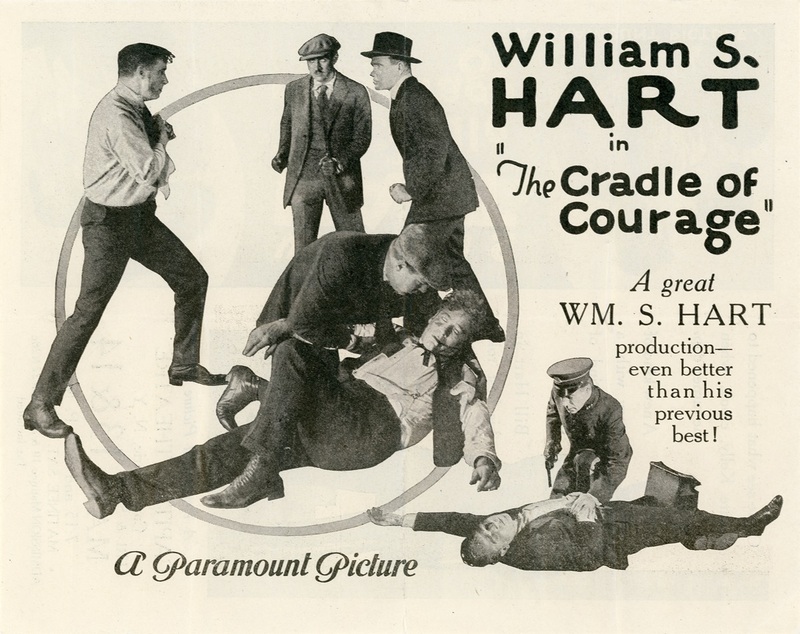 Toronto Film Society presented The Cradle of Courage (1920) on Monday, October 24, 1966 as part of the Season 19 Monday Evening Silent Film Series, Programme 1. This film was made in the year that Gloria Swanson and Wallace Beery surprised their friends by running off and getting married. Whether this romantic event occurred before, during, or after the making of this particular film, we don’t know. (The marriage was dissolved two years later). 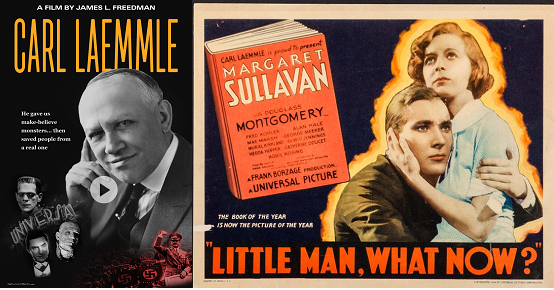 We need hardly point out, even to the younger generation, that this little film is not being offered as representative of either Gloria Swanson or Wallace Beery, whose great days as film stars were still in the future. (See Page 5 for biographical sketches). Bobby Vernon, however, was a popular star of innumerable two-reel comedies in the ‘teens and ‘twenties. This is an unabashed “message” film. Several years ago Toronto Film Society ventured briefly into film production, and this award-winning short (Canadian Film Awards, 1954) was one of the results. 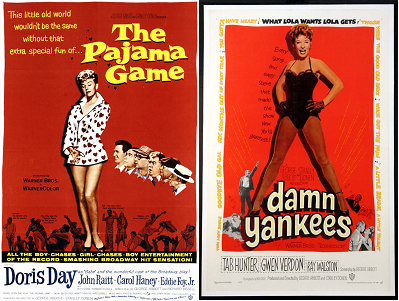 Viewers in 1966 may need to be reminded that in 1953 when this film was made (a) the Yonge Street subway was not yet in operation, and (b) Toronto Film Society showings were held in the theatre of the Royal Ontario Museum. We have another off-screen romance here. Harold Lloyd married Mildred Davis, and they seem to have lived happily ever afterwards. High and Dizzy was shown in the TFS Silent Film Series in 1961; we trust you don’t feel this is too soon to show it again. Two seasons ago we showed Hart’s The Toll Gate. The Cradle of Courage was the film immediately after it. 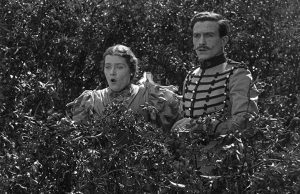 Though Hart is rightly remembered as a Western star, he did occasionally offer variety by breaking the routine and appearing in a non-Western, and this film is an example. (Another of his films, The Captive God, was set in Aztec Mexico). Even so, the theme–that of the Bad Man who Reforms–makes this atypical Hart film regardless of the locale. Hart was apparently fascinated by this theme; it recurs time and time again throughout the whole of the ten years of his film career. (For biographical sketch of Hart, see page 3). Incidently, it might be of interest to point out that it was Lambert Hillyer (see also below in the note on Hart) who in 1943 directed the now-famous serial The Batman. (For the sake of the record, this is not to be confused with its 1949 sequel, New Adventures of Batman and Robin, directed by Spencer Bennet. The latter is the one that has been shown in Toronto recently; but the former has been revived in New York and elsewhere). Ann Little will be seen again later in the season as Wallace Reid’s leading lady in Excuse My Dust, made in the same year. The following is reprinted from the program notes for The Toll Gate (TFS Silent Series, Feb 8, 1965). Most of the information comes from the chapter on Hart in The Western by Fenin and Everson, which everyone interested in the subject should read if he has not already done so. William Surrey Hart was born in Newborough, New York, on December 6, 1870, and when he was quite young his father, who was a miller, moved the family out to the West, eventually settling just outside a Sioux Indian reservation in the Dakotas. As a boy, Hart played with the Indian children, learned their language and customs, and never lost his love for them. While still an adolescent he worked as a trail-heard cowboy in Kansas, and once had the alarming experience of being caught in the crossfire of a sheriff and two gunmen on the streets of Sioux City. (Movies and TV, it seems, didn’t invent these things after all). Much has been made of Hart’s first-hand knowledge of the West and the consequent authenticity of his films; but the truth is that he was still only fifteen when he and his family returned to the East. His lifelong passion for the Old West was undoubtedly due to its being his own personal Rosebud; but while his memories of his childhood may well have remained very vivid, one is tempted to wonder how accurate they were. However, he undoubtedly supplemented his memories with a great deal of research, like any hobbyist with a passion for his subject; and anyhow, how many other makers of Westerns have had even that much first-hand acquaintance with Western life in the early 1880’s? After his return east he worked at odd jobs for several years until he became stage-struck and took up acting. His first professional appearances were in Shakespearean roles, (and in the short speech he recorded for the sound camera in 1939 as a prologue to a reissue of Tumbleweeds he still sounds like an old Shakespearean actor). In 1899 he was in the original cast of a Broadway smash hit: the stage version of Ben Hur, in which he played Messala,–a role that kept him busy for several years. After the last chariot race was run he went through another lean period before he entered still another phase of his stage career by appearing in various Western dramas, such as The Virginia and The Squaw Man. Of all the stage stars who went into films at that period, Hart was probably the only one who did so not reluctantly, swallowing his pride out of sheer economic necessity, but because he was actually anxious to make films. What happened was that he went one day to see a Western movie and was so appalled by its inaccuracies that he conceived the ambition to make Western films himself, to show people what the West was really like. Fortunately for him, he discovered that an old actor pal of his, Tom Ince, had now become an important movie producer out in Hollywood, in partnership with D.W. Griffith and Mack Sennett, and Hart had only to ask and it was all arranged, in spite of Ince’s misgivings that Westerns had become a drug on the market. 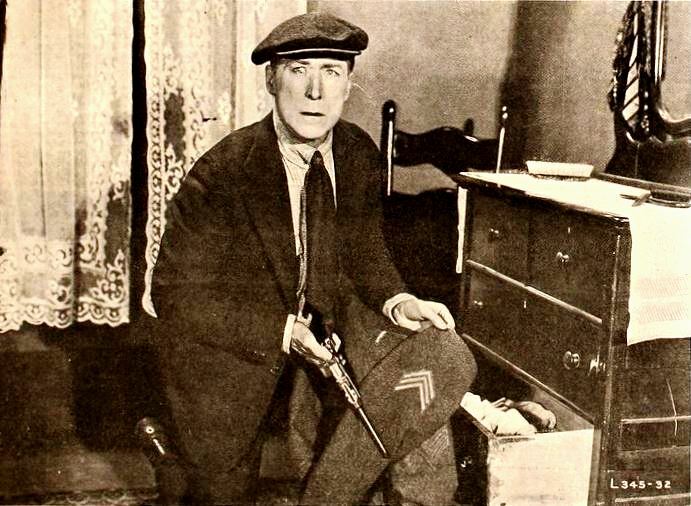 Thus, in the summer of 1914, did William S. Hart enter films at the age of 44. His first two films were shorts, in which he played villains; then he was starred in two features: The Bargain (written by himself) and On the Night Stage, and these proved such hits that Ince promptly signed him to a contract as a director-actor. Thereafter Hart directed most of the films he made for Triangle Pictures (Ince): shorts at first, while he learned his craft, then features exclusively. When he moved to Famous Players-Lasky (Paramount) in 1917, he took with him most of his own crew, including his cameraman, Joe August (who later shot The Informer and other John Ford films), and one of his writers, Lambert Hillyer, who thereafter directed most (25 out 27) of the films he made for this company between 1917 and 1924, (and doubled for Hart in many of the more dangerous stunts). …By and large, most of Hart’s films were realistic Westerns in which he played the Good Bad Man. Unfortunately, as time went on the sentimental streak in him began to get out of hand; and his films became slower and heavier, for he steadfastly refused to introduce action for its own sake. (Tom Mix, over on the Fox lot, had no such scruples, and the public was showing an understandable preference for the livelier Mix films). After his 25th film for Paramount (Travelin’ On, March 1922), Hart retired for over a year, then came back and made two more: Wild Bill Hickok and Singer Jim McKee, the latter of which was such a clinker that Adolph Zukor ordered him to submit to supervision. Hart refused to compromise, and left the company. For United Artists he made Tumbleweeds (1925), a big-budget epic which, in spite of its flaws, was in many ways one of his best. But the public barely returned him his production costs; so once again he retired, this time forever. He settled on his ranch at Newhall, California, and wrote books, including his autobiography My Life East and West (1929). 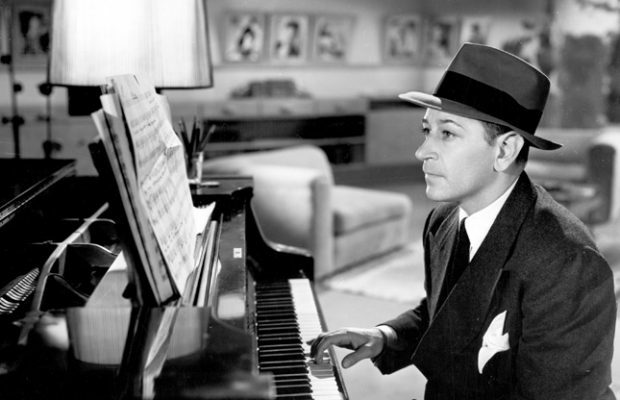 Two tentative arrangements to return to the screen came to nothing; and he died on June 23, 1946. By the terms of his will, his ranch has been opened to the public as a museum. NOTE: This list is not guaranteed complete; our research was casual, not exhaustive. Release dates are given wherever they were readily available, but they are to be regarded as approximate only. Titles in CAPITALS are features; title in Lower Case are shorts. GLORIA SWANSON was born in Chicago on March 27, 1898. She was thus 18 years old when Teddy at the Throttle was made in 1916. She had begun her screen career a year or two earlier as a bit player in the Essanay studios in Chicago. Proceeding to California, she became a Mack Sennett bathing beauty for a couple of years, but by 1919 she was signed by Paramount and appeared in a whole string of Cecil B. DeMille domestic dramas (Don’t Change Your Husband, Why Change Your Wife?, For Better for Worse, Male and Female, et al.) At this period she was more noted for her lavish gowns than for any histrionic ability (critics usually called her “a beautiful clothes horse”) but in 1923 Paramount transferred her to their New York studios (presumably to keep her and Pola Negri out of each other’s hair) where her films (most notably Manhandled) suddenly demonstrated an unsuspected acting ability and a gift for comedy. Eventually Swanson formed her own company, releasing through United Artists. The advent of sound revealed her the possessor of a beautiful speaking voice (and singing voice; in her first talkie, The Trspasser, she introduced the song “Love, your Magic Spell is Everywhere”), but her popularity was already on the wane, and before the mid-1930’s Gloria Swanson as a film star was through. She never ceased to be active, however; she pursued business interests and did stage work. Her memorable screen comeback in Sunset Boulevard (1950) was unfortunately never followed up. But she still remains a legend. WALLACE BEERY (1885-1949) left home at 16 to join the Ringling Brothers circus, graduated to the legitimate theatre, but backslid into movies around 1912. He appeared in many Essanay comedies as “Swedie”, a female role. He presently turned serious and for many years he was the screen’s arch-villain. We’ll see him later inthe season in Fairbank’s The Mollycoddle. (He later played King Richard in Fairbank’s Robin Hood). 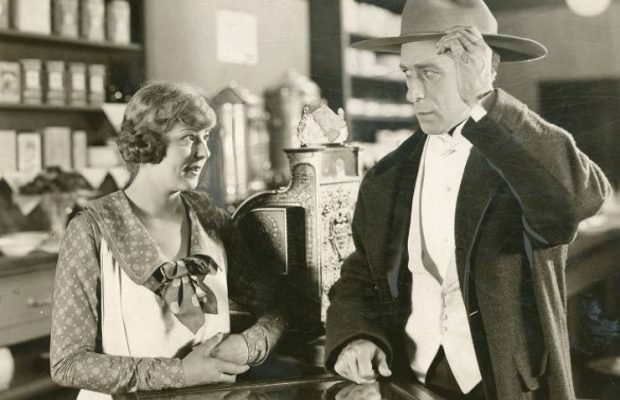 Around 1926 he returned to comedy in a seris of films with Ramond Hatton, and in early talkies he was teamed with Marie Dressler (Tugboat Annie, Min and Bill et al). His last film was Big Jack with Richard Conte (1949).